Meet the boys of the band, Assemble the Skyline. 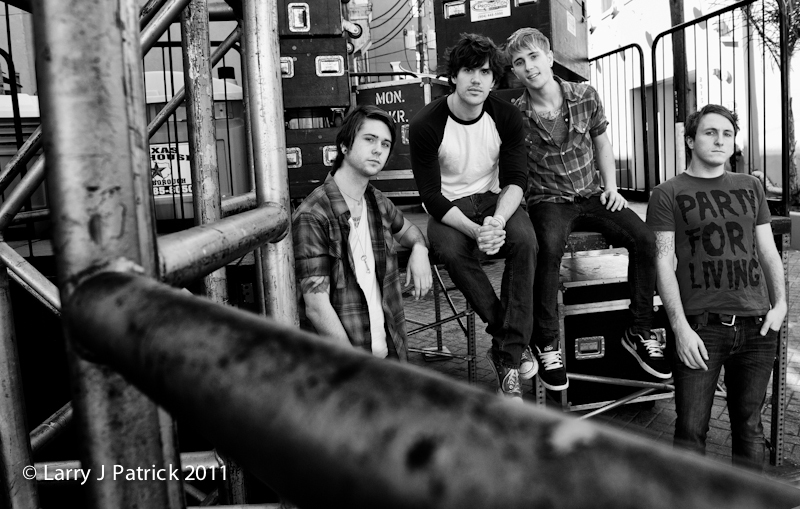 The boys are from left to right: Austin, Luke, Nick and Max. Steve and I had the pleasure of shooting the band last Friday. It was a great shoot. Why? Well, to begin with, the guys are really fine young men. They were willing to do anything that Steve or I asked them to do. So naturally, we tried all sorts of new things. Second, I got to play with my new Pocketwizard triggers. I was impressed with their performance, but must admit there is a learning curve with them. This photo is all natural light. It was behind the stage in Galveston. 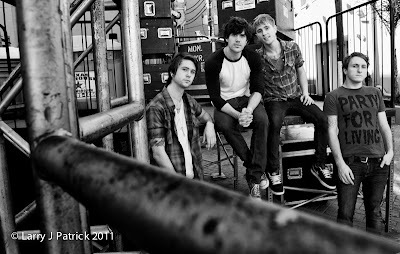 I wanted the photo to have a behind the scenes look so I used the stage hangers as props to frame the band. Camera settings: Nikon D3, Nikon 28-70mm f/2.8 shot at ISO 800, f/8 and 1/350th of a second. Lightroom 3—Set black and white points, cropped photo and added a vignetting. Photoshop CS5—used nik Silver Efex Pro to convert the photo to black and white. The composition is very strong with the leading lines into your subject. Still, I wonder whether making all the lines in focus would have made it stronger. Also, I think cropping a little from the left side would have focused the image a little better. Agree with Professor. Like the back stage look. I like the off center position of the band here, and don't think a crop from the left would look as good. All of the lines in the shot are really interesting and add to the image, the blurry pipes in the foreground do not bother me. I love the black and white too --- nice portrait! It would look great as an album cover...maybe on the back though and the one you submitted for Honor's Night would HAVE to be on the front --- that one is incredible! I hope you will be posting it on your blog.